Fine sand will make a wheel like this spin around lively. Most of the parts are easily made, the wheel offering the most difficulties. 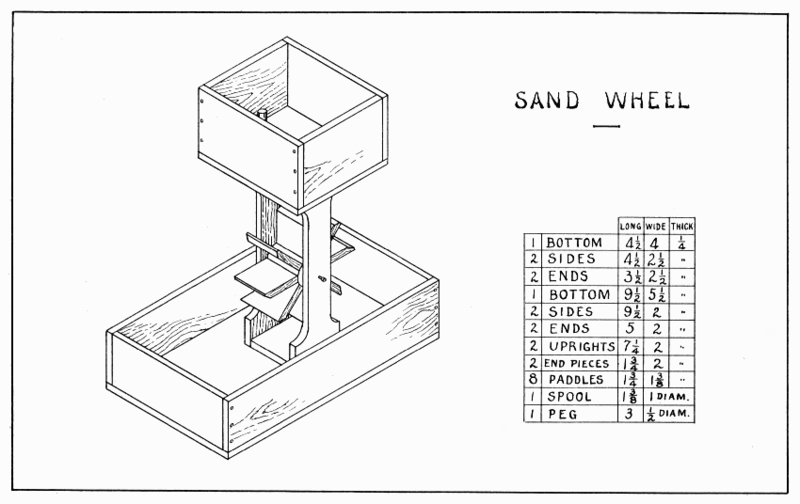 As shown in the drawing it consists of two boxes, uprights connecting the two, and a wheel with paddles swung on an axle between the uprights. To make the curves on the uprights, lay them edge to edge in the vise and start the spur of a large bit in the crack, 1-1/2" from each end. If a big spool cannot be obtained for the wheel, plane out an octagonal block 1-3/8" long, 1" in diameter. The slanting part of the spool must be whittled away. Divide one end into eight equal parts and draw lines lengthwise on the spool at each division. On these lines, measure very carefully 11/16" from one end. Then, holding the spool level in the vise bore 3/16" holes half thru the spool at each of these dots. The easiest way to lay out the paddles is in one long piece as shown in Fig. 4 below. If lines A and B are sawed carefully, they will fit the spool well enough to glue. The stems of the paddles go into the holes bored in the spool. They are easily made round by paring the corners a little, and then screwing them around in a 3/16" hole in a piece of hard wood. The ends of the paddles where the sand strikes are beveled on the underside. The holes in the uprights, thru which 1-1/4" brads are pushed into the center of the spool, must be exactly opposite each other, 3-1/4" from the bottom. Little leather washers should be put between the spool and the uprights. Now make the boxes. To nail the boxes to the upright follow the suggestions for nailing the floor of the weather cottage (Weather Cottage at StansPlans.com). Keep the brads near the center of the uprights lest they split the curves. 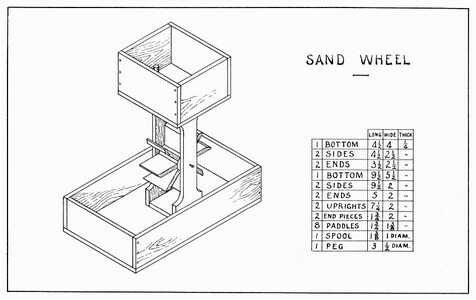 A 5/16" hole for the sand is bored in the upper box in such a position that the sand will strike near the middle of the ends of the paddles. The peg is tapered to fit this hole.